Count Alucard (Dracula spelled backwards) goes to Louisiana to make willing Louise Allbritton his bride. But she has other ideas up her sleeve. Very atmospheric film starts slow but really picks up speed in the middle leading to a great, unexpected ending. Lon Chaney Jr. is (surprisingly) good as Alucard and the atmosphere is just beautiful…swamps drenched with fog and moss. 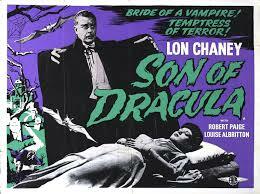 Also Chaney plays Dracula NOT his son (despite the title). This was the first movie to use Alucard as an anagram for Dracula. This was considered a lousy horror film for many years–most people complained that Chaney looked WAY too healthy to play an undead vampire and they found the plot slow. Now it’s getting the recognition it deserves. A well-done, neglected little gem. And, again, the ending is GREAT!